Joigny is a pretty little town on the banks of the river Yonne in the Yonne department. 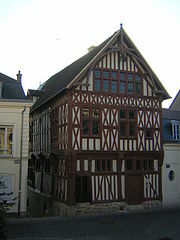 The town has several superb examples of Burgundian Renaissance architecture, with sculpted wooden pillars separating panels of colombage - a sort of wattle and daub material. The houses are stepped further out at each storey and lean out across the narrow medieval streets to meet each other. The best time to visit Joigny is on Wednesday or Sunday morning, when the main market is held, in and around the market hall beside the quay known as "Premier Dragon". There are stalls with all the local specialities: spicy bread, sausages, cheeses such as the St Florentin - and of course wine! And if after all this you need a little exertion to wear off the calories, Joigny is a departure point for many boat hire companies.